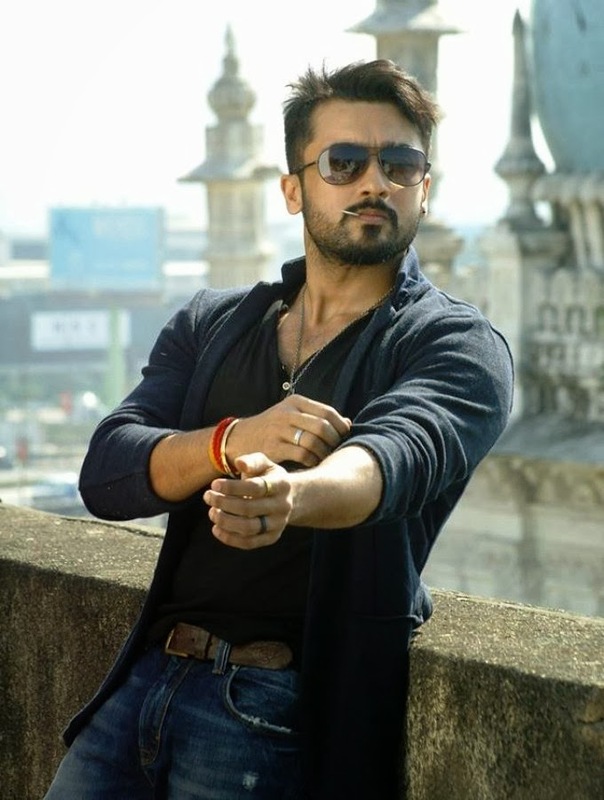 Anjaan is a 2014 Indian Tamil action film directed by N. Lingusamy, and produced under his banner Thirupathi Brothers. The film stars Suriya in a two distinct roles with Samantha Ruth Prabhu as the female lead, while Bollywood actors Manoj Bajpai, Vidyut Jamwal and Dalip Tahil play supporting roles. Cinematography and editing were handled by Santosh Sivan and Anthony, respectively, while Yuvan Shankar Raja composed the music. Singam II is a 2013 Indian Tamil action film written and directed by Hari. A sequel to the 2010 film Singam, the film stars Suriya who reprises his title role along with Anushka Shetty, Hansika Motwani, Vivek and Santhanam in supporting roles. Produced by S. Lakshman Kumar, it has music and background score by Devi Sri Prasad. The film was released on 5 July 2013 along with a Telugu dubbed version titled Yamudu II, earning mixed to positive reviews from critics. A Hindi dubbed version entitled Main Hoon Surya: Singham II released later on 2 August. 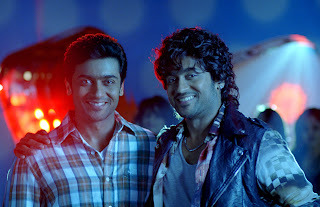 Maattrraan is a 2012 Tamil action thriller film directed and co-written by K. V. Anand and produced by Kalpathi S. Aghoram, starring Surya portraying conjoined twins, along with Kajal Aggarwal in lead roles. It also features Sachin Khedekar, Tara, Ajay Ratnam, Ravi Prakash and Shankar Krishnamurthy in supporting roles with Isha Sharvani making a special appearance. Maattrraan released worldwide on 12 October 2012 along with a dubbed Telugu version titled Brothers. 7aum Arivu is a 2011 Indian Tamil science fiction thriller film written and directed by A. R. Murugadoss, featuring Surya, Shruti Haasan and Johnny Tri Nguyen. The film, produced by Udhayanidhi Stalin began production in May 2010; it was released on 25 October 2011.The visual effects for the film were done by US based Legacy effects, making this their second Indian film after Enthiran. The film was also one out of several films selected by the South Indian Film Chamber of Commerce for the Oscar Award for "Best Foreign Film". Rakta Sarithiram is a two-part Indian biographical film based on the life of Paritala Ravindra, directed by Ram Gopal Varma. The film features Vivek Oberoi as Ravindra in the lead role, whilst Surya plays Surya, who predominantly appears in the second part. Shatrughan Sinha, Sudeep, Abhimanyu Singh, Kota Srinivasa Rao, Sushant Singh,Priyamani, and Radhika Apte play other supporting roles. The film was released in three different languages. The Telugu and Hindi versions were released in two parts, six weeks apart, while the Tamil version was released as a single film titled Raththa Sarithiram. Singam is a 2010 Indian Tamil action-masala film directed by Hari, starring Surya and Anushka Shetty in the lead.The film, produced by K. E. Gnanavel Raja in association with Reliance Big Pictures, and distributed by Sun Pictures, was released on 28 May 2010. Upon release, the film was dubbed into Telugu and released as Yamudu.The film's success led to remakes in Kannada as Kempe Gowda, in Hindi as Singham, and in Bengali as Shatru. Aadhavan is a 2009 Tamil action thriller, directed by K. S. Ravikumar and written by Ramesh Khanna. The film features Surya Sivakumar in the title role along with Nayantara in lead roles and Murali, Vadivelu, Anand Babu, Ramesh Khanna, B. Saroja Devi, Rahul Dev, Sayaji Shinde in its supporting cast. The music is composed by Harris Jayaraj. The film, was released on October 17, 2009 during Diwali. The film was dubbed into Telugu as Ghatikudu. 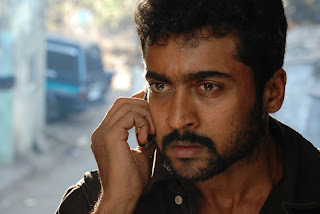 Ayan is a 2009 Tamil action thriller film written and directed by K. V. Anand. The film, starring Surya, Prabhu, Tamannaah and Akashdeep Saighal in lead roles, was produced by M. Saravanan and M. S. Guhan, while distribution handled by Sun Pictures. The film score was composed by Harris Jayaraj, the soundtrack released on January 19, 2009. Edited by Anthony Gonsalvez, the film was filmed by M. S. Prabhu. Vaaranam Aayiram is a 2008 Tamil romantic drama written and directed by Gautham Menon.Surya plays dual lead roles, with Simran Bagga, Sameera Reddy and Divya Spandana. The film had been under production since late 2006, and was released worldwide on November 14, 2008. It was dubbed and released in Telugu as Surya s/o Krishnan. Vel is a 2007 Tamil action-drama film written and directed by Hari and produced by Mohan Natarajan. It stars Surya and Asin and features Vadivelu, Kalabhavan Mani and Nassar in supporting roles. The film's score and soundtrack was composed by Yuvan Shankar Raja. The film was released on 9 November 2007, coinciding with Diwali, and became a success at the box office. Upon release, the film was dubbed into Telugu and released as Deva. Sillunu Oru Kaadhal is a 2006 Tamil romance film directed by N. Krishna. It starred Surya, Jyothika and Bhumika Chawla in pivotal roles, while Shriya Sharma, Sukanya, Vadivelu and Santhanam played other pivotal roles. The film's score and soundtrack were composed by A. R. Rahman, with lyrics by the Indian poet Vaali; while cinematography for the film was handled by R. D. Rajasekhar and editing was handled by Anthony. 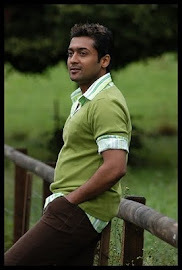 The film was released on 8 September 2006, three days before the marriage of Surya and Jyothika. Aaru is a 2005 Indian Tamil action-masala film written and directed by Hari. It stars Surya and Trisha in lead role. The film's score and soundtrack were composed by Devi Sri Prasad. The film released on 9 December 2005 and was a hit at the box office. The film was also dubbed and released in Telugu under the same title. The movie dubbed in Hindi as The Return of Ghajini. Ghajini is a 2005 Indian Tamil psychological thriller film directed by A. R. Murugadoss released on September 29, 2005. The film stars Surya, Asin, Nayantara, Pradeep Rawat and Riyaz Khan. It was dubbed and released in Telugu by Allu Aravind in November 2005, and both versions enjoyed critical and commercial acclaim and became blockbusters. It was remade into a Hindi film by Murugadoss again in 2008, starring Aamir Khan with Asin playing the same role. The film's idea and lead character's struggle are inspired from Christopher Nolan's Memento. Maayavi is a 2005 Tamil comedy-drama film directed by D. P. Singapuli that stars Surya and Jyothika who plays an extended cameo as herself, whilst Vijaykanth and Roja play short cameo roles. The film's score and soundtrack were composed by Devi Sri Prasad. The film was released in 2005. Aayutha Ezhuthu is a 2004 Tamil political film written and directed by Mani Ratnam. It stars Surya, Madhavan and Siddharth in the lead roles, with Meera Jasmine, Trisha Krishnan and Esha Deol also in pivotal characters. The film's score and soundtrack is composed by A. R. Rahman, while Ravi K. Chandran was cinematographer and Sreekar Prasad was editor. The title of the movie is the name of a Tamil letter, ஃ - three dots corresponding to the film's three different personalities from completely different strata of society. The film was simultaneously shot in Hindi as Yuva with an entirely different cast barring Deol, while a dubbed version in Telugu was also released. Produced by Ratnam's home banner of Madras Talkies. Perazhagan is a 2004 Indian Tamil film directed by Sasi Shanker, starring Surya and Jyothika with both playing dual roles. The supporting cast includes Vivek, Manorama and Manobala. The film's score and soundtrack were composed by Yuvan Shankar Raja. 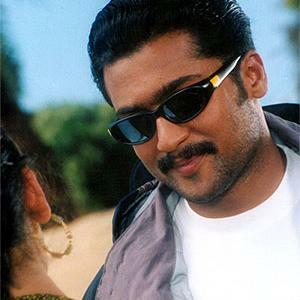 The film, which is a remake of the 2002 Malayalam film Kunjikoonan, which starred Dileep and Navya Nair as the lead couple and was also directed by Sasi Shanker, was released on 6 May 2004, receiving favourable reviews and winning three awards at the South Filmfare Awards for the performances of Surya, Jyothika and comedian Vivek, respectively. This film was remade into Oriya as "Rasika Nagar". Pithamagan is a 2003 Tamil feature drama film directed by Bala. The film stars Vikram, Surya, Laila, Sangeetha, and Simran. The film's score and soundtrack are composed by Ilayaraaja. The film was dubbed into Telugu as Sivaputrudu (The son of Siva). Vikram won the National Film Award for Best Actor for his role as Chithan. It was remade in kannada as Anatharu with Upendra playing the role of Vikram and Darshan playing role of Surya. Kaakha Kaakha is a 2003 Tamil crime thriller film written and directed by Gautham Menon. Starring Surya, Jyothika and Jeevan, the film featured music composed by Harris Jayaraj and cinematography by R. D. Rajasekhar. The film released to positive review in August 2003 and went on to become the first blockbuster in Surya's career and was considered a comeback film for producer Kalaipuli S. Dhanu. Since, the film has been remade into several languages. Mounam Pesiyadhe is a 2002 Indian Tamil romantic drama film, directed and written by Ameer Sultan, making his directorial debut. It stars Surya, Trisha, newcomers Nandha and Mahaa and choreographer-turned-actor Anju Mahendra in supporting roles along with several other newcomers, while Laila Mehdin appears in a cameo role during the climax. The film, released on December 13, 2002. 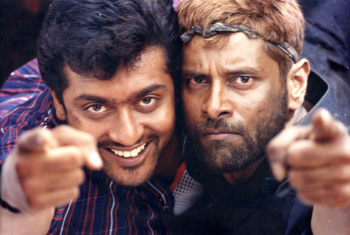 Shree is a 2002 Tamil action film directed by Pushpavasagan which stars Surya in the title role, with Shrutika and Gayatri Jayaraman in supporting roles. Unnai Ninaithu is a film starring Surya, Sneha and Laila. This film was later remade in Telugu as Cheppave Chirugali in 2004. Nandha is a 2001 Indian Tamil drama film written and directed by Bala, starring Surya and Laila in the leading roles, while Rajkiran, Saravanan and Rajshree play other supporting roles. The film also marked the debut of comedian Karunas, whilst its music was scored by Yuvan Shankar Raja and cinematography handled by R. Rathnavelu. The film released on 14 November 2001. Friends is a 2001 Tamil comedy film directed by Siddique and produced by Appachan. 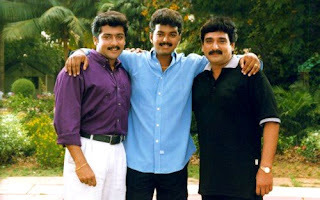 The film featured Vijay and Ramesh Khanna, Surya, in the title roles, while Devayani, Abhinyashree, Vijayalakshmi, Sriman and Vadivelu amongst others play supporting roles. The music was composed by Ilaiyaraaja, while Anandakuttan handled cinematography. The film is a remake of the Malayalam film by the same name with actors Mukesh, Sreenivasan, and Jayaram. The film released in January 2001. Uyirile Kalanthathu is a 2000 Tamil film directed by Jaya which stars Surya, Raghuvaran and Jyothika in the lead roles, with Sivakumar and Radhika in supporting roles. The film opened in September 2000. Poovellam Kettuppar is a 1999 Tamil romantic comedy film written and directed by Vasanth, which stars Surya and Jyothika in leading roles. The film, also starring Vijayakumar, Nassar,Vadivelu, Ambika and Manorama in pivotal roles, was released on 6 August 1999. Periyanna is a 1999 Tamil film directed by S. A. Chandrasekhar featuring Vijaykanth and Surya in the lead roles. Meena and Manasa play other supporting roles, the soundtrack for this film composed by debutant music director Bharani. The film released on 14 April 1999. Sandhippoma is a 1998 romantic film Tamil language film directed by Indrakumar. The film features Surya and Preetha Vijayakumar in the lead roles, while Raadhika, Prakash Raj, Sarath Babu and Ambika also play significant roles. Deva composed the film's soundtrack while Rathnavelu handled the camera work. The film released in July 1998. Kaadhale Nimmadhi is a 1998 romantic film Tamil language film directed by Indiran. 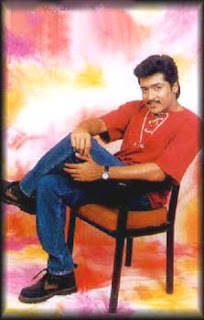 The film features Surya, Jeevitha Sharma and Sangeetha in the lead roles, while Murali makes an extended guest appearance. Raadhika, Manivannan and Nassar also play significant roles in the film, while Deva composed the film's soundtrack. Nerruku Ner is a 1997 Tamil film directed by Vasanth and was produced by Mani Ratnam. 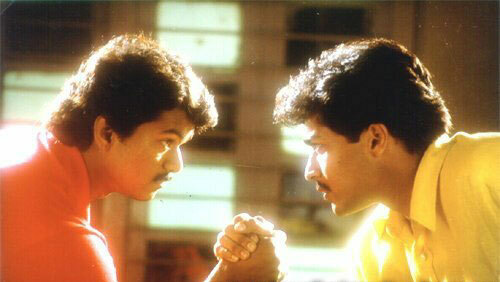 The film features Vijay and Surya in the leading roles, with Simran and Kausalya in other lead roles. Raghuvaran, Shanthi Krishna, Karan, Vivek, Manivannan and Prakash Raj form the ensemble cast, while Deva and K. V. Anand handled the film's soundtrack and cinematography respectively.